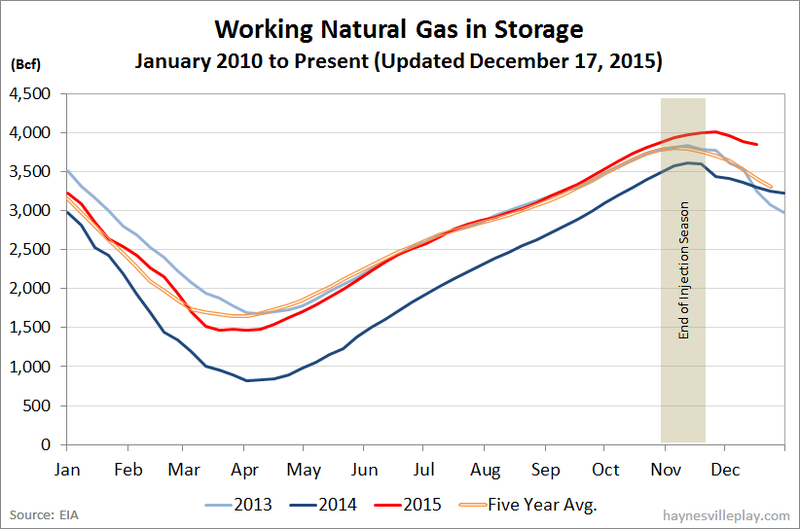 EIA reported that working gas in storage was down only 34 Bcf last week to 3.846 Tcf. The light withdrawal is not a great surprise to weather watchers. The upcoming green Christmas week should continue to put pressure on gas prices for weeks (months? years?) to come. The withdrawal last week was 44% lower than last year (-61 Bcf) and 72% below the five year average (-120 Bcf). 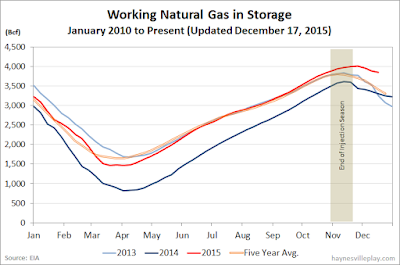 The current storage level is now 16.4% higher than last year (3.305 Tcf, a difference of 541 Bcf) and 9.1% above the five year average (3.524 Tcf, a difference of 322 Bcf).